You are here:Home » Category: "X-rays"
Hi. This is Dr. Antolak from thegentledentist.com in Shelby Township Michigan. 586-247-3500 is our number. And we use digital radiographs, digital x-rays in our office. It reduces radiation. It also gives us the ability to manipulate the images. And it gives us the ability to email the images to referral sources if they need them. And we can even do that with patients and to insurance companies if they need that information. What I’m going to show you here is the process of taking an x-ray. Keep in mind that digital Panorex is as well as digital regular x-rays, smaller ones, have about 20%. They only used 20% of the radiation that a film-based x-ray will use. So it is significant reduction in x-rays and also gives us more detail and you’ll see how that works out. So first thing that we do is because this is generated by our computer and the computer actually captures the signal that going out. That is how this works. So I put, put our patients, Jacklyn’s name in here. And that’s going to come up as an image like that. All I’m going to do is I’m going to connect up with, put this little button here. And then get our image ready. So, we’ll show you how that works in just a second. So one thing we always do is protect our patients. That’s, that’s our number one concern is our patients’ safety and so for Jackie we’re going to go ahead and put a lead shied on her. So you can turn this way. There, there you go. You can feel like you’re Super Woman. So that’s going to go like that. And what we’re going to do here, Jackie, is we’re going to use our, our disposable in here you’re going to actually bite down on this little edge here. So let me just get this prepared for you. So what you can do is step up to here. You’re going to put your hands right here. You’re just going to bring your edges of your teeth are going to bite on the edge of that, right there. That’s it, just close like that. This is going to come down just slightly. Okay, good. And then, what I want you to do is to put your feet up a little bit further, a little bit more. And you’re just going to be holding on mostly with your, okay? So you’re, going to get into a very awkward feeling position. This is going to go up a little bit more. Now I want you to really stretch the back of your neck up.. You’re nice and young and you can do that. Okay, very good.. I’m just going to make sure that’s right. So we have certain settings that we use. And so what you’re going to do is, this x-ray is going to go around your head, okay? In a moment I’m going to have you take a deep breath. Then you’re going to swallow. And when you swallow, you’re going to keep your entire tongue to the roof of your mouth. You can do that, right? Okay, good. So, let’s come back over here. Jackie take a deep breath, swallow, and this is going to go right over your head. Keep your tongue right to the roof of your mouth. Go right around your head. So, as this is going around her head, it is also catching an image of her jaw. There you go. Okay very good. Now, watch your head and, I need to have you straight back. You let go there. Yes, you never know which tune it’s actually going to, put out of the output button there. Let’s see, it’s Jingle Bells. See, it’s just a little bit late for Christmas, isn’t it. It’s fun when it’s in July, when Jingle Bells plays. Let’s go ahead and reset that, and we’ll take a look at your image. This is your image here, and we can manipulate that image a bit, and make it lighter or darker. And this is your right this is going to show an x ray and what’s kind of interesting here is that this is your jaw bone this is your nerve right here that goes in your jaw so we can’t see this with a regular x ray that the small x ray that we showed you before so here and right where this cursor is here this is exactly here your nerve is right here see your nerve is nice and deep. You’ve had all four of you with us in p3 move and normally the wisdom teeth are going to be right here this is an artifact I’m sure exactly what that is but it’s nothing to be concerned about um and you have like one little filling on your upper right hand side. These are your sinus cavities right up in here, and right up in here is your sinus here also, and up in here is your jaw joint. Can’t see that all that area but that’s your jaw gin right there and this part about an image like that is that we can change it all around and make it so that it can it can be it can be manipulated and changed and in a way that makes it more conducive to passionately seen. For example we can take it and do some pretty interesting things. We can go in we actually colorize it, which is pretty cool. You can change the coloration of, of the teeth. That sometimes that can help to determine whatever you want it to determine. There’s your earring right there that you have in your ear. See that little thing right there? So, anyhow, these are some things we can do that helps to enhance our abilities to do accurate diagnosis on you and that’s good. So if you’re interested in having high technology using less radiation and it’s quick; as soon as it was taken that Panorex x-ray, it was putting it into our computer. So there’s no waiting at all for that. So we’d like to try to be as efficient as we can with time. So if you have any questions, you can call us at 586-247-3500. Thank you and have a great day. Hi, this is Dr. Antolak from thegentledentist.com in Shelby Township, Michigan and our number’s (586) 247-3500. One thing I’ve been using for the last, gosh, I think it’s been around 6 or 7 years, is digital x-rays. Digital x-rays are very interesting. And they’re becoming more state of the art. But not every dental office uses them. And this is called a digital sensor. It is made out of micro. There’s very small processors inside of this. And this hooks up to our computer. We put a sleeve, a disinfection sleeve over that and use that to take an x-ray. That x-ray appears after only about 2 seconds, after that x-ray appears on our monitor, the nice part is we can manipulate it. We can turn it different colors, we can increase the contrast with it and the nice thing is too, is that it only takes about; maybe 20% of the radiation that the regular film type of x-ray takes. There are very helpful when we do, let’s say place an implant and we want to check angulation of something. 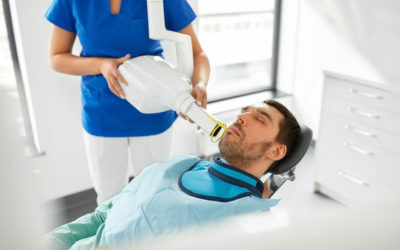 Or, if we’re doing a root canal where we remove, where we want to check the length of what something that we call file so it ends property and its very convenient also because we get an instant feedback if something needs to be changed on it so this is just one of the things that we do in our office to help with radiation safety. Obviously we still use a lead vest that goes over your whole chest. So, you basically get no radiation at that level to affect you and your body. We also use digital x-rays. We also have a digital panorex machine which goes around your head and captures your entire jaw, including the jaw joint, the wisdom teeth, and things like that will reduce radiation at that time too. So if this is something that you like to have technology used with you, so it can benefit you, and so that we can not only create high technology, but also high touch where we can really care about you, just give us a call at 586-247-3500. Thank you.